If you had to pick one word to describe what makes your auto insurance policy great, what would it be? If you’re a Direct Auto & Life Insurance customer, the word FLEXIBLE might do the trick! Not only do you get to choose from convenient payment options, like with MyAccount, but you get to pick the payment date and payment schedule that works for you. And when combined with our customizable payment plans, low rates, and low down payments, you get an auto insurance policy that will bend and stretch to fit your needs. Get a quote now and experience the calming convenience of a Direct auto insurance policy! 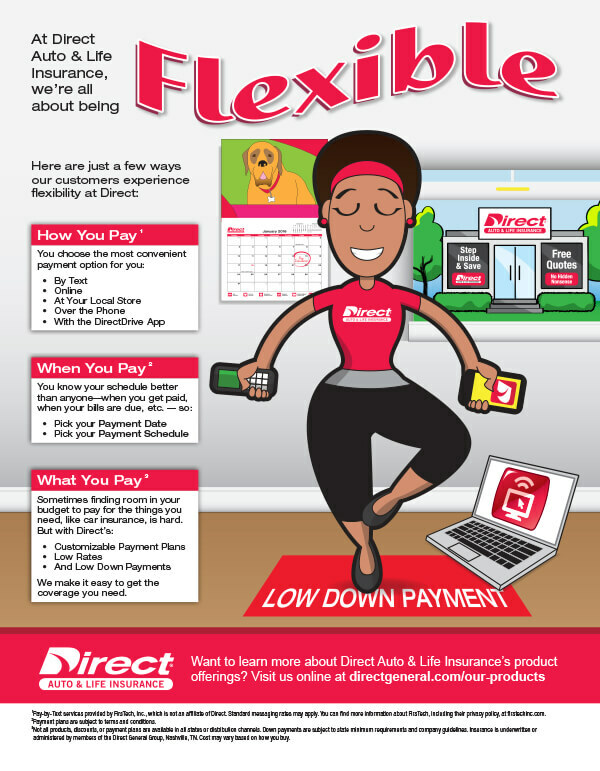 At Direct Auto & Life Insurance, we’re all about being flexible. We make it easy to get the coverage you need.